Finally the second away game of the season arrived and we were off 140km south to the city of Thanh Hoa. Thanh Hoa City is the capital of Thanh Hoa province and has a population of around 197,000; it’s located just 16km from the coast and the popular local beach town of Sam Son. Getting there we opted for the bus, not as comfortable as the train but slightly quicker. Alarms rang early on Saturday morning, coffee cured the early moans of ‘I can’t be bothered’ and we were soon on our way to the bus station; but not before a mad dash back to the house as I’d forgotten the all important breakfast sandwiches; a feature of my football travelling for well over a decade now! That was a close call. Buses head south from My Dinh station in the west of Hanoi. My Dinh is a typical bus station with plenty of people willing to take you to their bus for an inevitable kick back from the driver. First we were offered a sleeper bus that didn’t seem likely to move for a few more hours and seeing as the journey would only take 3hrs a bed would have been excessive. Finally another guy was marching us through the crowds of people to his bus that proudly displayed its sign saying ‘Thanh Hoa’, and it was already half full. Sure enough it filled up quickly and my excitement kicked in; we were on our way. Or I thought we were. Leaving the station was a tricky task with bus drivers seemingly thinking they were still driving their motorbikes and all heading simultaneously for any small space vaguely in the direction of the exit. Some 30 minutes later and we finally crawled out of the station; we were really on our way now! The journey was good; a comfortable bus, negotiable fare as normal, nice scenery around the karsk formations of Ninh Binh province and the Jason Statham box set rolling out all is greatest action film including the rather apt Transporter. Just over three hours later we were passing through what we believed to be our destination and gestured to get off the bus; whilst the bus was still moving and in to the middle lane of oncoming traffic we jumped off in Thanh Hoa. The driver didn’t even pull over to the pavement for us. Thanh Hoa seems to be a rather pleasant town with a very different pace than that of Hanoi. The roads and pavements are wide and there’s plenty of space to wander around amongst the nicely manicured parks. The locals were very intrigued by us; not too many foreigners would normally stop and we were consistently greeted with ‘hello’ and plenty of long stares. We made for the stadium early, after the large crowd of last week we were optimistic of more fans. 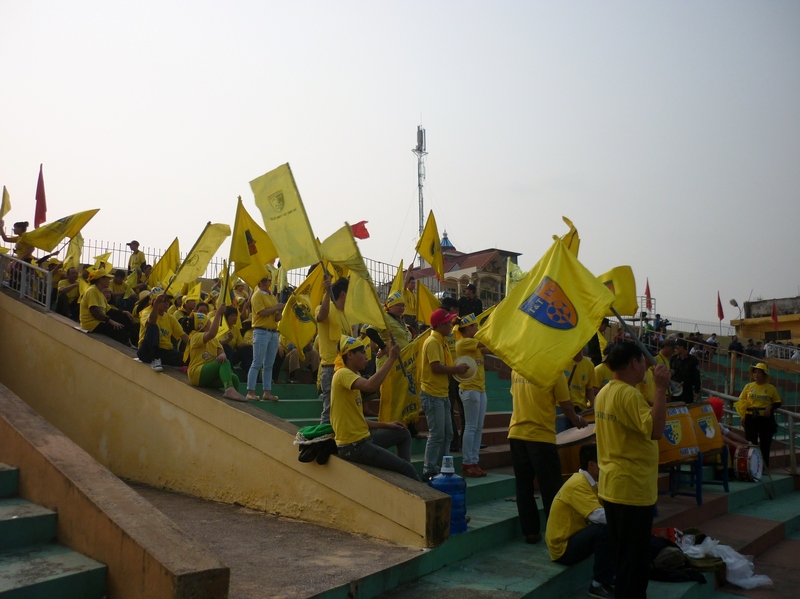 The stadium, San Van Dong Thanh Hoa, is small with two single tier stands running down either side. Outside fans were gathering for a pre-match meal or beers in the numerous cafes that lined the street opposite the main entrance. In search of the ‘away’ fans section we wandered around the ground. Panic set in when we couldn’t find a separate entrance or even any other T&T fans. Eventually we spotted some Hanoians and followed in the hope they would lead us to the secret gate. They too seemed a little lost and after some awkward smiles, waves and handshakes we were now a larger group of lost fans. Time for another lap of the stadium, by now plenty of stares were heading the way of the ever expanding group of T&T fans that seemed to just be walking aimlessly around and who had gathered the only two foreigners amongst their ranks. This situation soon got the attention of the Vietnamese TV crew who were interviewing fans and filming the build up to the match. It was time for my Vietnamese TV debut. I say Vietnamese debut as I’d previously been on Kids TV in China dancing with a midget in a bear suit singing nursery rhymes but that’s another story. As the camera and mic were set in place a number of local Thanh Hoa fans gathered around to view the Englishman give his verdict on today’s upcoming match and Vietnamese football in general. The T&T fans didn’t seem interest one bit except one women trying to get her daughter on TV by pushing her to stand next to me. The reporter, with suddenly impeccable English then began asking a range of questions; Why do you support T&T? will you go to EVERY game? What do you think of Vietnamese fans? Is Cazorla Arsenals best player? will they, in my opinion make the top four of the Premiership this year? So there it was; back to the EPL. A couple of foreigners had traveled to bizarrely watch T&T play away at Thanh Hoa and obviously caused a bit of a stir by turning up. However, the conversation finishing on how I see Arsenal finishing this year goes to show how important the English league is here, good fun but a bit disappointing seeing as what looked to be a near sell out crowd was embarking on the stadium to enjoy Vietnamese football. Finally we were on what was hopefully our way into the away section; we set off around the ground again. This time once we reached the far corner a gate seemed to have magically appeared and was wide open with a few policemen nearby and the red wig wearing T&T Fan standing with a handful of match tickets. He gave us a quizzical look, handed two tickets over which we in turn passed to the the policeman who ripped it to shreds and we were ushered inside; but we hadn’t paid and on each attempt to were knocked back friendly smiles. The stadium is old with two large stepped concrete banks for stands and no seats. The pitch looked horrendous with large patches of grass missing and an incredibly uneven playing surface. Along with the other 50-60 fans that seemed to find the magical gate before us and had already decorated our section with the yellow flags of T&T and set up the drums, we were set for a great afternoon. As with our first away game we were greeted with flags, headbands and T-shirts (although there was no chance that I was getting in to what seemed to be an extra small shirt,I did try though, much to the delight of those sitting nearby). This time however we were recognised by those that also made the trip to Ninh Binh; the foreigners had returned and seemed to be actual T&T fans. This was great, especially as we met a fellow fan named Nam who was able to translate many of the questions that the others fans had for us…….which were a lot. As the game neared, the party atmosphere in the away section got in to full swing and through the numerous flags I could see the home sections were swelling with fans, with many climbing various steps/walls in search of a decent view. The houses behind each goal also proved a popular vantage spot. The game got underway in glorious evening sunshine and T&T began brightly, similar to the SLNA match and were passing with confidence. Early chances came as T&T looked for Gonzalo and Samson at every opportunity. Vinh Loi in the Thanh Hoa goal fancied his moment on TV too and produced a couple of acrobatic saves early on. Thanh Hoa couldn’t get hold of the ball with T&T pressing well when not in possession and seeking to get the ball out wide with each attack. Thanh Hoa then did break forward and a nice pass led Hoang Duong in to the T&T area, who then under pressure from the T&T defence threw himself in to the air, pirouetted and rolled around on the ground. The referee blew for a penalty. An unbelievable dive! Rightly so both Thanh Luong and Cristiano were furious with the officials. Ceh stepped up and converted for the home side, 0-1. The home fans celebrated wildly. As the game resumed T&T continued to dominate with Thanh Hoa looking like a rather average team but were somehow leading. The T&T fans continued singing and cheering the team onwards. The home fans decided it was time for 20 minutes worth of Mexican waves. With ten minutes until half time Thanh Hoa began wasting time and committing innocuous fouls whenever possible; with 55 minutes left of the match! 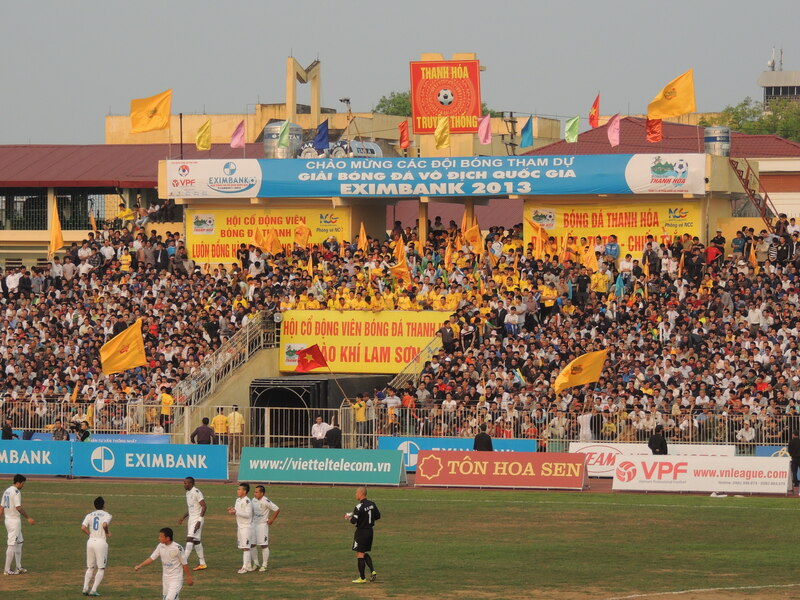 This infuriated Hanoi but was also a sign of their dominance as Thanh Hoa were desperate to disrupt any flow. Half Time 0-1. More free food; I must take some to the next game to share. The second half again started with T&T possession and some more half chances; I was confident that with this much pressure an equaliser was not far off. Van Hieu headed narrowly wide before Hong Son made a great save after a rare breakaway chance led to Dieng racing through for Thanh Hoa. T&T were awarded a free kick, on 71 minutes, some twenty yards out and more gamesmanship led to Thanh Hoa players wasting time but eventually ending with their goalscorer, Ceh, arguing and pushing one of his own defenders away so the game could continue. Gonzalo drilled the free kick against the wall but the ball came back to him and he struck it beautifully first time and it flew low beyond Vinh Loi in to the corner.1-1! Four minutes later T&T pressed again, the fans continued dancing and flag waving (which looks great but makes it hard to see the pitch! ), Hanoi took a corner that went long, eventually falling to Quoc Long who hit his shot in to the ground threw a crowded area and in to the back of the net. 2-1! The T&T fans were delighted dancing and singing, somehow knowing their team would go on to win even with 15 minutes to go. Another attack led to the ball reaching Samson who hit T&T’s third, which I could barely see through the flags, and the Hanoi players/fans went delirious, while the Thanh Hoa fans went home. 3-1. The final whistle blew and for at least 24 hours T&T would sit at the top of the VLeague. The local police locked us in for a while to ensure the home fans would make there way out first reducing any possibility of trouble….a standard situation in many games I’ve seen across Europe. This time allowed more of the Hanoians to introduce themselves and share celebratory handshakes and high fives. It was also discussed with a group of Hanoians that we will indeed be heading to Danang on the overnight train for the next match six days later; which delighted many of them.